Thanks to a dedicated group of volunteers, this historical property in Beloit stands to see its 150th anniversary this year. Read about the determination it’s taken to preserve the structure and how you can explore it today. Sheri and Jim Disrud are longtime members of the Friends of Beckman Mill, a group of dedicated volunteers that restored the historic mill, which has stood along Raccoon Creek for 150 years. One of the oldest operating mills in Wisconsin resides in Beckman Mill County Park, just six miles west of Beloit. Thanks to a dedicated group of volunteers, this restored gristmill is celebrating its 150th anniversary this year. Beckman Mill is fully operational, with power coming from the original water-driven Leffel turbine, which was created in the 1860s. If backup power is ever needed, the mill can still be operated thanks to its 1920s-era Titan two-cylinder tractor engine. Jim says the mill can grind any sort of grain, but corn is popular because it’s the easiest to break down and it’s easily available. The shelled corn is separated and grounded into corn meal, which is sold on site. The mill remains intact thanks to the tireless efforts of volunteers from the Friends of Beckman Mill, who are responsible for the restoration of the mill, along with other attractions around the 50-acre park, including a new dam, a sawmill display and a gift shop. William Howe built the mill along Raccoon Creek in 1868, shortly after the Civil War, setting up on the former site of the Goodhue distillery, which was destroyed by a fire in 1853. Howe ran the mill until 1872, when he sold it to Louis Hyde and Elias Teall. In 1882, August Beckman purchased the turbine-powered mill. He dubbed it Beckman Mill and ran it until his death in 1908. His sons, Charles and Henry, assumed ownership. The whole-grain buckwheat flour was sold in 5-, 10- and 20-pound paper bags, either at the mill or door-to-door. Henry died in 1939 and Charles owned the mill until his death in 1966. The mill was put on the National Register of Historic places in 1977. 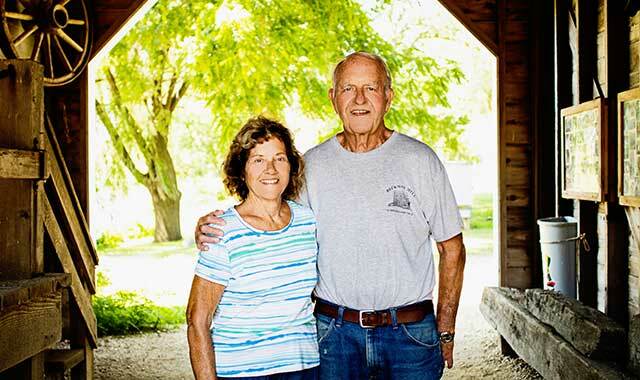 A year later, the Beckman family sold the mill and accompanying property to Rock County. Since the county didn’t have the funding to make necessary updates at the time, the mill sat idle and slowly deteriorated until 1990, when Friends of Beckman Mill was formed. The group entered into a lease agreement with Rock County, such that the county takes care of the grounds and Friends of Beckman Mill oversees the buildings. After a property analysis, the group started fundraising before tackling the restoration. The original foundation was deteriorating, the floors were sagging and the roof had constant leaks. The milling equipment, at the time, was not functional due to wear and neglect. To make things worse, vandals were constantly defacing the building and stealing valuable artifacts. Those who visit the mill today are usually impressed with the quality of the building’s restoration and its look of originality. The inside of the mill looks much as it did back in 1868. Interior additions include a corn sheller, a small burr mill and an auxiliary elevator. Friends of Beckman Mill offers tours May through October, on Saturdays and Sundays from 1 to 4 p.m. Sheri says the mill is full of learning potential for kids and adults. The Friends of Beckman Mill continue maintenance of the old structure, but Sheri wonders how much longer they can keep up the momentum. After more than 30 years in existence, the group has welcomed very few new members. Sheri hopes a younger generation of volunteers can step up in the near future. To learn more about volunteering, call (608) 751-1551 or visit beckmanmill.org. Sheri says it’s hard to describe her passion for preserving this significant part of the region’s past. This entry was posted on Friday, August 17th, 2018 at 11:55 am	and is filed under Northwest Business Magazine. You can follow any responses to this entry through the RSS 2.0 feed. Both comments and pings are currently closed.